Andrew J. McDonald strengthened ecumenical ties with other churches in Arkansas and supervised a greatly expanded role for lay persons during his 28 years as the fifth bishop of Little Rock. The gregarious “man from Savannah” championed inter-denominational efforts on behalf of organized charities as he encouraged a spiritual renewal in Catholic parishes statewide. To the masses Bishop McDonald is known for his jokes and contagious laughter. On a more personal level, the gifted writer and historian corresponded regularly with members of his flock never forgetting the anniversaries of significant events, particularly those marking a family member's death. He continues the practice today. He was the 11th of 12 children in a devout Irish family. After his May 8, 1948, ordination, Father McDonald served as chancellor and vicar general of the Diocese of Savannah. He also earned a doctorate of canon law from the Lateran University in Rome. 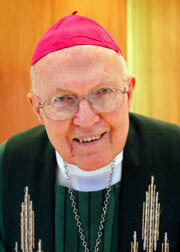 Prior to learning of his selection as bishop of Little Rock in June 1972, then-Msgr. McDonald had never served a parish outside Savannah. He had visited Arkansas twice, both times to visit with seminarians attending St. John Home Missions Seminary in Little Rock. Bishop McDonald arrived in Little Rock on Sept. 6, 1972, a day after his ceremonial elevation to the episcopacy at a Savannah cathedral. A precipitous decline in vocations to the priesthood and religious life proved to be an early, an enduring, challenge for the new bishop. In line with Vatican II recommendations, Bishop McDonald instituted a permanent diaconate for the diocese in 1978. Three years later, 27 men were ordained as deacons to help overburdened parish priests with their ministerial duties. Renewal movements thrived. Among these were Cursillo, a joining of clergy and lay people seeking guidance from the Holy Spirit; Marriage Encounter, a strengthening of marital bonds; Pre-Cana, a Church-based program of marriage preparation and Retrovaille, a ministry for troubled marriages. A Little Rock couple, with the help of Arkansas clergy, developed the Bible study program, Little Rock Scripture Study. Today this program is worldwide with materials and presentations offered in many languages. Outside the church walls, Bishop McDonald worked with leaders of other faiths to seed and support organizations that fed and clothed the needy, sheltered the homeless and abused, and raised the social conscience. The same bishop who invited Mother Teresa of Calcutta to open a home for unwed mothers in Little Rock in 1982 also helped promote a Billy Graham Crusade at War Memorial Stadium in 1989. A diocesan Office of Justice and Peace took liberal, sometimes unpopular positions on social, issues such as the military draft and nuclear disarmament. The bishop adopted what he called a “laid-back” attitude on those matters but he was a forceful and vocal proponent of the sanctity of life. In 1990, he opposed the state’s first legal execution in more than a quarter-century. Throughout his tenure, Bishop McDonald denounced the 1973 Supreme Court decision legalizing abortion. 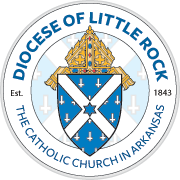 He organized a Respect Life office in the diocese and led the annual March for Life each January down Capitol Avenue in Little Rock. In 1998, Bishop McDonald submitted his resignation at age of 75 as required by Church law. However, he not replaced until Pope John Paul II (now St. John Paul II) appointed Father James Peter Sartain (now Archbishop Sartain of the Archdiocese of Seattle) as his replacement in 2000. Bishop Sartain was installed as the sixth bishop of Little Rock on on March 6, 2000. After retirement, Bishop McDonald began a new ministry as chaplain for the Little Sisters of the Poor and the elderly residents at St. Joseph Home in Palatine, Ill. in 2002. He continued that ministry until he retired as chaplain in 2013. Bishop McDonald remained at the home as a resident until his death at the age of 90 on April 1, 2014.